You also get with your purchase of Raphil® hair cutting shears a free leather case. Country wide free shipping on the purchase of our hair shears (Except AK, HI, PR). Special!!! Call us to buy any 3 Shears for $100 with Free Shipping. Order via Phone. Description: Blue Titanium haircutting shear, Bevel edge, High Grade 440C Stainless Steel. Comes with Free shipping! Free Leather case! Free finger inserts! Description: Rainbow color finish haircutting shear, Bevel edge, High Grade 440C Stainless Steel. Comes with Free shipping! Free Leather case! Free finger inserts! Description: Mirror face Blue Titanium finish Bamboo design hair cutting shears. 440C Japan Steel. Free shipping! Free Leather case! Free finger inserts of your color choice with the purchase of hair shears ! 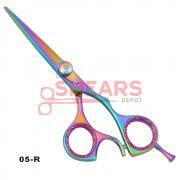 Description: Rainbow titanium finish Bamboo design hair cutting shears. 440C Japan Steel. Free shipping! Free Leather case! Description: Blue Titanium polish hair cutting shear. 440C Japan stainless steel. Free Shipping! Free leather case! Free finger inserts! 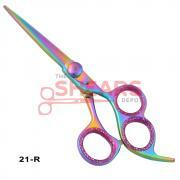 Description: Rainbow pro shears. High grade 440C Japan steel. Bevel edge. Free Shipping! Free leather case! Free finger inserts! 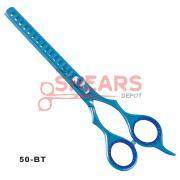 Description: A superb hair cutting scissor with a blue titanium finish. Made of high professional grade 440C Stainless Steel. 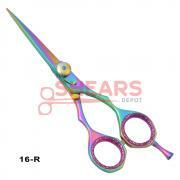 Description: Excellent quality hair cutting scissor with a Rainbow multicolor finish. A beautiful design. Description: A very nice Rainbow finish hair cutting scissor made of high professional grade 440C stainless steel. Description: A beautiful hair cutting scissor made of professional grade 440C Stainless Steel. Description: High quality Blue Titanium finish 440C stainless steel haircutting shears. Razor sharp cutting edge. Free Shipping! Free leather case! Free finger inserts! Description: Multicolor high quality 440C stainless steel haircutting shears. Free Shipping! Free leather case! Free finger inserts! Description: Blue Titanium hair shear, Bevel edge, High Grade Stainless Steel. Comes with Free shipping! Free Leather case! Free finger inserts! Description: High quality stainless steel haircutting shear with razor sharp bevel edge. Rainbow finish. Lovely design. Free shipping! Free leather case! Free finger inserts! Description: Blue titanium polish, high quality hair cutting shear with razor sharp bevel edge. Lovely design. Free shipping! Free leather case! Free finger inserts! 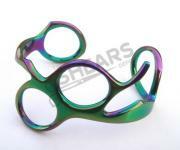 Description: Multicolor rainbow finish haircutting shears made of professional grade stainless steel. Free Shipping! Free leather case! Free finger inserts! Description: Lovely design. Made of professional grade 440C stainless steel. Available at amazing price! Description: Lovely design hair cutting scissor with a broad blade. Made of high grade professional 440C Stainless Steel.